We have now learned how to identify the ARIMA model for the time series. ​Let's do some forecasting based on the models that we built. In section 11, we have identified the model for the TS2 data set to be the ARIMA (1 1 0) model. 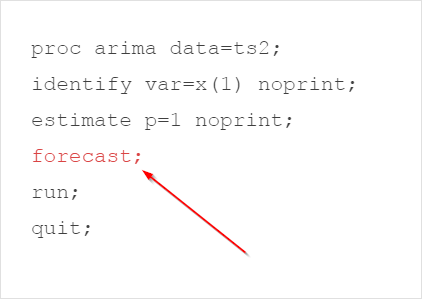 Forecasting can be done by simply adding a FORECAST statement in the ARIMA model. 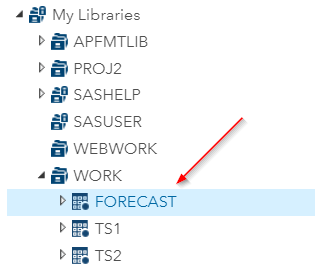 The FORECAST statement tells SAS to perform the time series forecasting. How accurate is the forecasting? This is a question a time series forecaster needs to know. One way to examine the forecasting model is to compare the predicted values and the actual values. We are going to perform the multi-step forecasting on the last 14 observations. 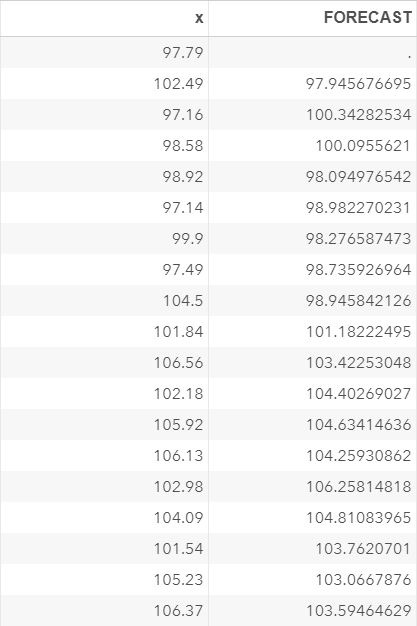 The LEAD=14 option tells SAS to perform the multistep forecasting for the last 14 observations. You can visualize the comparison between the predicted values and the actual values. The MAE and RMSE are two commonly used statistics to check the prediction accuracy. Proc ARIMA does not have any built-in options to compute the MAE and RMSE. We will first create an output data set that contains the predicted values and the actual values. The FORECAST data set contains the column X as well as the predicted values of X. Now, we are going to compute the MAE and RMSE using the last 14 observations of the FORECAST data set. The RAE and RMSE are computed as ​4.719 and 5.649, respectively. In section 12, we have identified the model for the TS3 time series to be ARIMA (0 0 1). 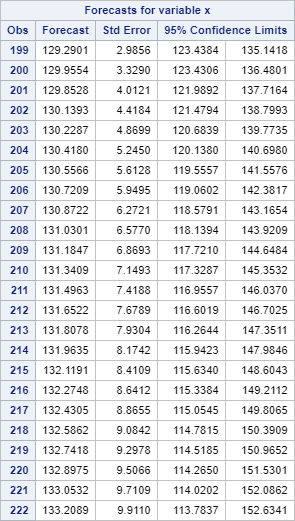 There are 198 observations in the TS3 data set. 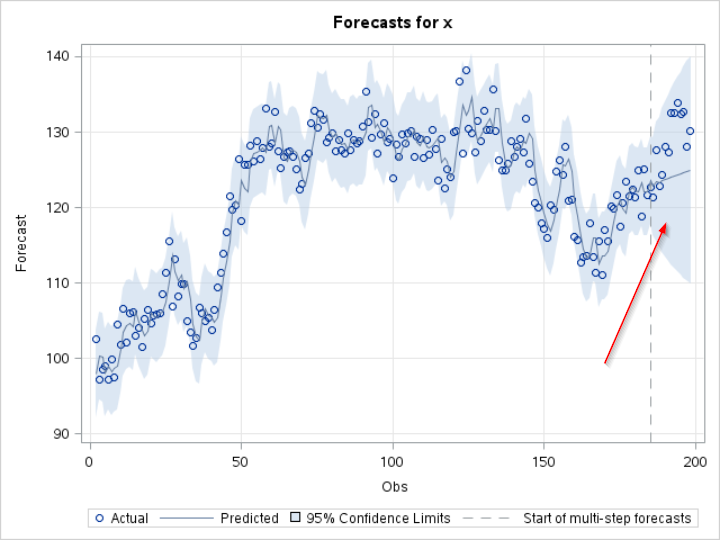 Perform the multi-step forecasting on the last 14 observations of the TS3 data set. Plot the forecasting values and compute the MAE and RMSE for the last 14 observations.